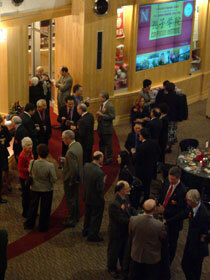 Now open in Nebraska Hall, UNL's new Confucius Institute was dedicated during activities Oct. 28-30, 2007. That's when a delegation of officials from Xi'an Jiaotong University, UNL's partner in the Confucius Institute arrived. As many as seven officials from Xi'an Jiaotong University were expected, along with 12 students comprising a musical band. Additionally, officials from Hanban, the Chinese agency that funds Confucius Institutes worldwide, and officials from the Chinese Embassy in Washington, D.C., attended. UNL's Confucius Institute is the 20th to open in the United States, and joins about 80 worldwide. October 30 was the opening ceremony at UNL Visitor's Center.